If you haven't heard and experienced a Yamaha Disklavier for yourself, forget any preconceived notions about "player pianos" you have ever had - how they sound and how they perform. Yamaha's Disklavier is truly a reproducing piano. Through its combination of both acoustic and digital superiority, Disklavier has become first choice of educators, pianists, and music lovers worldwide. So absolutely accurate is this Reproducing System, that Disklavier is the first and only product (not teacher) ever to receive the Frances Clark Keyboard Pedagogy Award (2006), as presented by the Music Teachers National Association (MTNA). 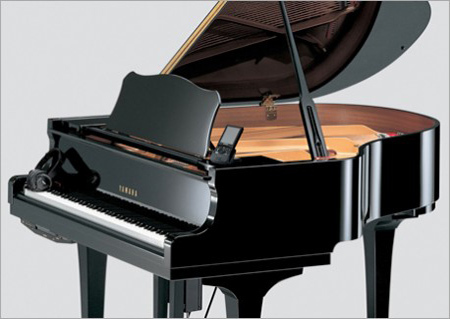 For detailed information about how Yamaha's Grayscale Optical Hammer Sensor recreates every nuance of the performer's phrasing and touch, please visit Disklavier's Web site. So, What's the Difference Between a Player and a Reproducing Piano? The essential differences boil down to the level of interactivity with you, the user. A Player piano can only playback performances that you feed it: prerecorded MIDI files on CDs, floppy disks, mp3 players (such as iOS devices), USB thumbdrives, etc. Many player systems can also playback ensemble and orchestral accompaniments along with the acoustic piano part. A Reproducing piano takes a major step forward by allowing you to actually capture (record) your own piano performances and then 'reproduce' those performances live on your piano. The initial shock and subsequent thrill of seeing your piano play you is compelling. The Yamaha Disklavier Mark IV system is so advanced it actually captures all the nuance of your piano performance from slow, legato key releases to subtle pedal phrasing on the soft (una corda) and damper pedals.